10 / 10 Arjays—because everyone knows Arjays are the coolest thing ever! This text below was originally written for a previous edition of the novel, now out of print. “When you’re in high school, it all seems so serious. Every little thing has cosmic ramifications. Everything is life and death. It’s only when you get some distance you realize it wasn’t that way at all.” This bit of dialog appears late in the novel The Wide Game, spoken without a trace of irony. And the reader knows by this point in the story that Paul Rice, our protagonist, would punch the speaker in the face if she were anyone other than his wife. Those who give in to the numbing effects of time and distance forget that a small percentage of every high school class never graduates due to suicide. For those lucky enough (or unfortunate enough, one could convincingly argue) to have a high school sweetheart, they experience a love more powerful and more pure than any to come after, resulting in scars of the heart and soul that never entirely heal afterwards. Some high school friends remain friends the rest of our lives. Music and movies make a far deeper impression. High school is an experience of feelings at its most pure, not because we can’t distance ourselves, but because most of us have not built up the walls that life and experience force us to build. The walls built between our true exposed selves and the rest of the word. Because high school teaches us to build those walls. So okay, I’m three paragraphs in, and I haven’t talked about the monsters. If you read Skull Full of Kisses (and if not, why haven’t you?) then you already know West can deliver on the scary. In The Wide Game, the scary comes in the form of an unspeakable evil that rises from the cornfield in a variety of terrible shapes and methods, and as the mystery unfolds, the motivation works beautifully. The blood is spilled, the scary things come. Terror ensues. Much has been said about the horror in this horror novel in plenty of other reviews. 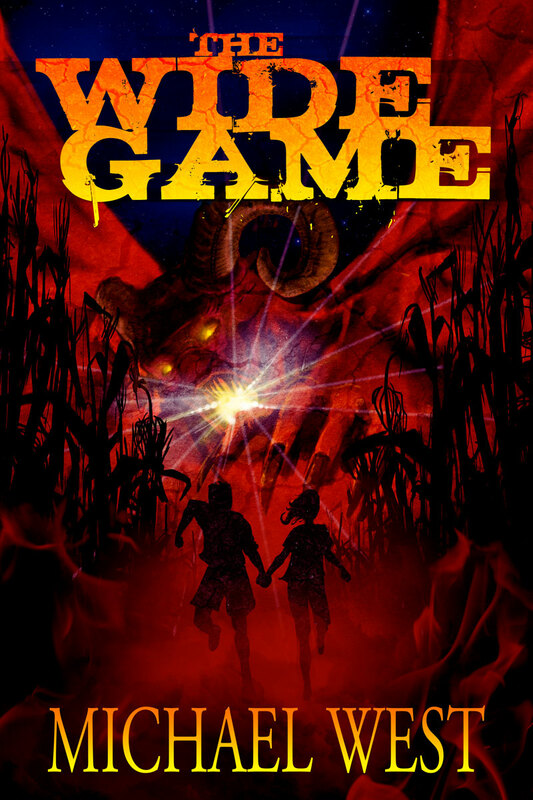 If you are here for a great horror novel, The Wide Game delivers. But what impressed me more about The Wide Game is West’s ability to create fully developed characters, even the ones that won’t make it to the end. Paul Rice, in the year 1997, returns to the small town he grew up in with great reluctance for his ten year high school reunion. Paul visits his mother’s home with his wife and two children, so grandma can watch the children and Paul and his wife can head off to the reunion proper. We hear references to a great tragedy during the class of 1987 Wide Game—essentially an annual small town senior tradition scavenger hunt / graduation party held in a giant cornfield. We learn that Paul, then a film major and participant in the game, actually captured some of these events on his video camera. Wisely, the book doesn’t spend a lot of time in 1997, but quickly jumps back to 1987, where we experience the events “live” as they unfold. And here is where the novel really resonated with me. We are dealing with the mid-80s, teenagers, and mass murder. Yes, West flirts with many of the teen horror movie conventions of the time. You have the high school sweethearts; the obsession with music and M-TV; The 80’s slang; the nerd and the bully; the bodyguard who defends the nerd; the jock; the stoners; the Laverne-and-Shirley-like best girlfriends. Incredibly and in spite of this, West manages to avoid the typical dumb teenager clichés while paying homage to the era that brought us these great clichés. Paul is very much in love with Deidra, and West takes his time developing their passion and budding romance, letting the reader experience it firsthand. The rest of the novel relies on the reader caring about them, and taking the time to develop the relationship pays off. Rather than bringing the story to a halt, it’s my favorite series of scenes. Paul and Deidra are sweet and likeable and sincere, and any reader whose heart is not made of gargoyle stone will get vested in their story. All this while already knowing that Paul’s wife in 1997 is named Mary, not Deidra. Paul falls hard for Deidra, invests his heart, his soul, and his creative romantic energy the way only a swooning teenager can—before the first heartbreak, the first shattering of romantic dreams, the first time you realize your destiny was not as set as you thought. I don’t know if West based this on reality, but I can take a guess. Having experienced a similar arc in my own high school experience (well, minus the being chased by psychotic pissed-off spirits in a cornfield part) West opens a creative vein of truth to bring the perfect touch of honesty to his fiction. For me the high school hi-jinks resonate to the point of a near-flashback, and the reunion worked equally well for reasons that enter into spoiler territory.